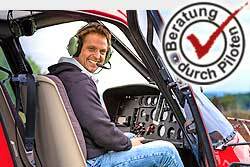 Our scenic flights over the Schwarzwald are unforgettable experiences. Treat yourself or somebody else with a extraordinary gift, then a helicopter flight let everyone "float". You fly with our experienced pilots, in a comfortable 4-seater touring helicopter on a window seat, on the best tours above your home. You can book a fixed date for a scenic flight, or you put your individual program together. The route can be discussed on the spot with the pilot. This depends on the weather and of course aviation safety, otherwise the pilot attempts to fulfill your wishes in compliance with the flight time.